My blog is a composition of endless and wavering thoughts that preoccupies me.This is an attempt to weave the ethereal mind and bring out the lyrics and rhythm in it. 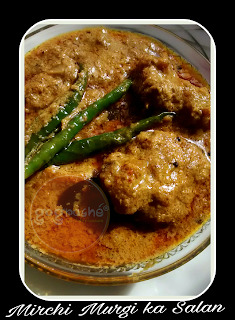 Mirchi ka salan (curry) is a traditional dish from the "City of Pearls" and divine Nizami cuisine. This peanuts and sesame based salan or curry is considered to be the most authentic accompaniment with biryani in Andhra cuisine and comes with many variations. Yes, you can make bhindi ka salan as well. I wanted to make a salan that could be served with phulkas or paranthas or as a side with plain steamed rice and that's how the germ developed to cook chicken and chilli curry , the Hyderabadi way. I had to tweak this traditional preparation a little bit so as to suit the typical Bengali taste buds, like the addition of jaggery, which you can omit. Secondly, I have added fresh coconut, as I personally feel it enhances the taste , but traditionally the recipe requires dry coconut. Also , since it is not possible to get the Bhavnagri chillies here , I had to make do with the longish organic chillies which I ordered online. Once in a while when you are in good cheer to make something exotic for the family , this dish could be given a thought. 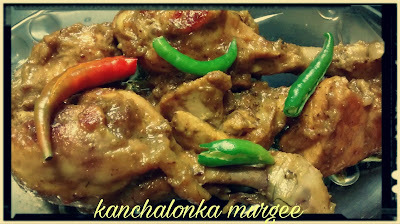 Marinate the chicken pieces ( boneless or with bone) with lemon juice, salt , haldi, black pepper powder and refrigerate for 2hrs. Take them out and shallow fry them , keeping the pan covered so that they are cooked properly . Almost done that is. Strain the oil and heat it again. Wash and de- seed the green chillies, fry them (lightly) and put them aside. Cool and blend with the garlic cloves and ginger. Add more oil if required and heat. Temper with mustard seeds and curry leaves. Brown the finely chopped onion and add the blended paste, alongwith haldi . Furthermore, add the tamarind pulp and jaggery. Let it simmer for a few minutes. Finally, add the chicken pieces and a cup of water. Let it soak in the flavour, and check the gravy to balance the seasoning. Once the chicken pieces are done, throw in the fried chillies, garam masala powder and increase the flame. Cook till the oil starts oozing. The gravy should be thick and not runny or watery. Before turning off the flame sprinkle the coriander leaves and keep covered till served. Uff, ye maa bhi na. Bekar ki chinta karti hai..
kisi se jhagra hua kya? Maa bohat chinta karti hai..
Maa hai na, chinta karti hai..
kuchh khaya hai subah se? उफ़्फ़, ये माँ भी न. बेकार की चिंता करती है..
किसी से झगड़ा हुआ क्या? तेल मालिश कर दूँ ? कुछ खा लेना हाँ ? माँ बहुत चिंता करती है..
कुछ खाया है सुबह से? माँ ही चिंता करती है .. This is a Maharashrian dish, a khichdi made with rice and moong dal. If you want you can add potatoes otherwise the flavourful tadka of dry chillies, hing and other ingredients is sufficient to satiate your palate. One awesome recipe, definitely for keeps. Take equal quantities of rice and moong dal . Add haldi ,salt, jeera and hing . 4 to 5 cups of water depending on the kind of consistency you prefer . Let this cook in pressure or a deep bottomed pan. Heat around half to three-fourth cup of oil . Temper with mustard , jeera ,sliced garlic , lots of dry chillies , chilly powder, one finely chopped small onion, hing , haldi and salt. You can add finely chopped potatoes at this stage. No sugar please . Now cover with lid and let cook . Once cooked pour this over the khichdi and enjoy accompanied by a glass of chilled buttermilk. 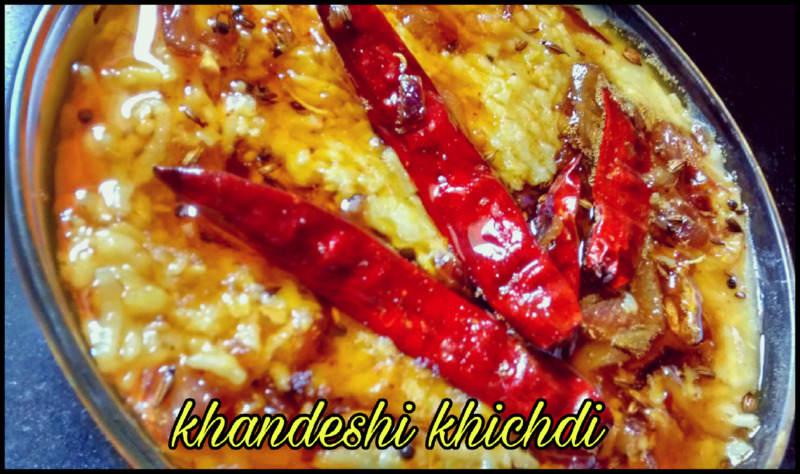 "Khandesh is a region in Maharashtra which has a very hot climate where the folks of that region love to eat spicy food, high on pungency . So basically this is a khichdi which is cooked without any spice but eaten with a super spicy oil .. "
Heat oil and fry the sliced onions , add some green chilli paste, grated or minced ginger followed by the chicken pieces. Give it a good mix. Cook on a high flame for a few minutes. Season with salt. Cover and cook on a low flame . Once the chicken is cooked, add a tablespoon of ghee/ clarified butter, sprinkle celery powder/ randhuni powder, few green chillies and cover the pan . Keep it covered till served. Heat mustard oil ( 2-3 tbspn ), temper it with dried red chillies, cumin seeds, hing and 9 to 10 crushed garlic cloves. AS they turn brown add the chopped greens. ON a medium flame keep stirring and cooking till the oil leaves the side. next step is to add the curds, which has been beaten nice and smooth. AT this stage increase the flame and as the water starts drying up, add salt. I also add little sugar as I always feel it balances the taste. But it can be avoided. I like mine bit overcooked and tangy. You may add less dahi and not overcook. sesame seeds and drizzle over the dish. I did not have sesame seeds while preparing this dish hence they are absent in the picture here. But do add them as they have great benefits and also add a nice crunch to the finished product. After 5-6 hours, soak one cup of poha / chewda for 5 minutes. Grind all the ingredients separately and then mix them nicely . the batter should be thick at this stage so use less water while grinding. Give the batter a nice mix , add a teaspoon of salt , mix gently and leave it covered for about 10 to 12 hours for fermentation. volume. beat it nicely , and add salt as per taste. For idli the batter should not be runny. For dosa you may need to add water and give it a gentle mix. Oil the idli moulds/ plates and pour the batter. Steam for 6- 7 minutes . 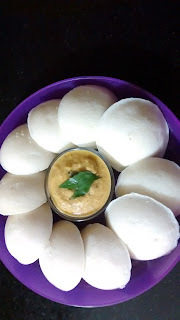 Insert a thin bladed knife or a toothpick in the center , if it comes out clean then you can spoon out the idlis. Or else steam it for another 2 -3 minutes. This is a very easy dish to prepare . Less time consuming , yet very tasty dish. These fritters can be enjoyed as a snack with tea or coffee or as a side dish with dal chawal or even khichdi on a rainy day. It is very important to choose the leaves which are crunchy and fresh. Wash them nicely. Now in a bowl , make a very thick batter with besan/chickpea, rice flour (one fourth of besan), salt (according to taste) and sugar (very little). To make it spicy you can add red chilli powder too. Allow the batter to rest for 5-10 minutes and beat it again nice and smooth. Heat the oil to a deep frying temperature. Lower the flame. Nicely coat each leaf with the thick batter and deep fry them on a medium to low flame, two to three leaves at a time. Drain the excess oil on a kitchen towel . Before serving, arrange the fritters on a platter and sprinkle some chat masala or black/ rock salt on them. Spinach greens are supposed to be highly nutritious with great health benefits. Deep frying them is not that healthy as this process will definitely lower the nutrition quotient of vitamin K and iron by several degrees. But, once in a while it is all right to give in to your food cravings and allow yourself an occasional indulgence. Happy snacking !! veggies like potatoes, cauliflower, broad beans , cowpea, green peas, carrots ( I like) etc. Wash and soak the rice for half an hour atleast. Roast and soak the daal as well. Bring water to boil in a deep bottomed pan or handi. Add the rice followed by the daal. Add salt and turmeric and let it boil. IN another kadhai heat mustard oil , temper with tejpatta, whole cumin and dried red chillies. Add tomato +ginger+ chilli paste, cook for a while. At this stage you may add cumin paste/ jeere bata or jeera powder. Then add salt, haldi, sugar, veggies and fry them nicely with the masala. Now assemble the tempered and fried veggies and rice and dal and let it cook on a medium flame. After one good boil adjust the seasoning. Add ghee. Once done sprinkle jeera powder (freshly roasted and ground). Cover the pan. Allow atleast 15minutes of standing time. Some like their khichdi runny/ watery, some like it thick . Some with a generous amount of ghee or butter, some like it light. When it comes to serving and taste , I always say, "TO EACH HIS/ HER OWN". Veggies like potatoes, cabbage,banana stem, brinjal, parwal, beans, broad beans, pumpkin, raddish, carrots.. In nicely heated mustard oil add panchforan, dried red chillies, little bit of ginger and green chilli paste , all the veggies , salt, haldi, sugar, fry on a high flame for few minutes then cover the kadhai with a heavy lid and cook on a low flame till done and the water has dried up. Once done add ghee and ground panch phoran and keep it covered till served. You may cut the veggies as per your liking but traditionally, potatoes, pumpkins, raw banana, brinjals are cut into cubes. Whereas the others like carrots, raddish parwals are cut lengthwise. Banana stem is cut into smaller pieces compared to other vegetables. Slice the brinjal and smear the slices with very little salt+haldi+sugar and keep aside. For the batter mix all the ingredients nicely with water. The batter should not be very thin, the consistency should be such that you are able to coat each slice nicely . The last step is to fry the eggplant slices nice and crispy. Always make sure that you have smoked the oil properly before frying. turn off the flame and reheat the oil, keep it on a medium flame while frying the fritters. It helps if a little hot oil ( about a tablespoon) is added to the batter and mixed well before dunking the slices. This trick works for almost all types of deep fried food. NIGELLA (SEEDS) CHICKEN/ KALOJEERE MURGI.. Beat the curds with a pinch of maida nice and smooth. In a bowl smear the chicken properly with all the masalas, curds , lemon juice and refrigerate for 1-2 hours. In a deep bottomed pan/wok, heat the butter and add the chicken with all the marinade. Keep stirring and cooking on low to medium flame till done. For increasing the gravy you may add a little milk. Best had with rumali rotis or paranthas. A must try dish. Introducing self has never posed such a thought provoking self-introspection earlier. In social circles, I have always been known less as 'self' and more as a suffix to relations that I am tied to. The blog gives me the first opportunity ever to proclaim the'me' in myself. Well, I am a woman bestowed with a new found freedom in expressing the wavering thoughts throughout the day in weaving the ethereal and sometimes the surreal mind in lyrics and rhythm. This is the new me to begin with! The compositions are my intellectual property and anyone found copying would be infringing the same. Simple theme. Powered by Blogger.